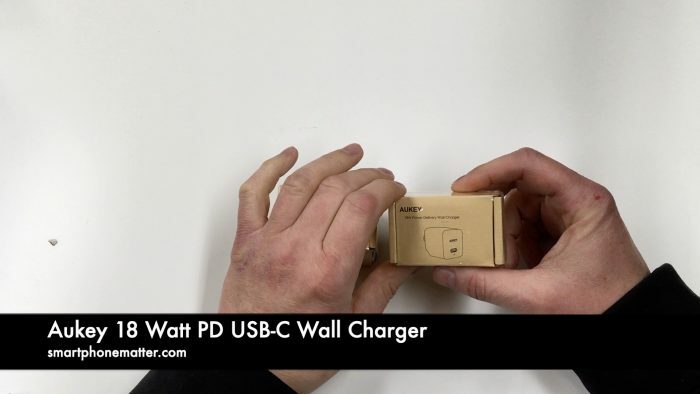 I picked up these two Aukey 18 Watt PD UBB-C Wall Chargers from Amazon.com. I paid $25 for two of them but I used a discount code that since expired. At the time I am writing this they currently sell for $20, though make sure you check the different sellers on Amazon. These chargers are 18W and support Power Delivery meaning they can be used to fast charge devices. I bought two, one to use to fast charge my wife’s new 2018 12.9″ iPad Pro and my iPhone X. The iPad Pro ships with Apple’s new 18W USB-C Power Adapter and an 1M USB-C to USB-C cable. In the video I compare the Apple and Aukey Charger. The Apple charger is wider by shorter, its more like a rounded rectangle. The Aukey charger is more square. It reminds me more of the the Apple charger that ships with iPhone. The Aukey charger also has a folding power prongs which makes it more compact for travel. It’s available in both black and white. I tried the iPad Pro with the Aukey and it would charge the device. The iPad Pro was already charged so I haven’t tried doing a full charge yet. To use the Aukey to charge my iPhone X, I needed a USB-C to lightning cable. Right now, only Apple sells this type of cable. They have not licensed any other companies to make them as part of their MfI program. So I picked up an Apple USB-C to Lightning Cable. The cable is 1M long and costs $19. So far I have tried the Aukey charger and Apple cable with my iPhone X and it seems to work fine. I haven’t tried doing a full charge yet nor checking to see how much faster my iPhone X charges with Aukey. I’ll update this when I see the results of the fast charging.